Twenty-four experts from the fields of Ancient History, Semitic philology, Assyriology, Classical Archaeology, and Classical Philology come together in this volume to explore the role of textiles in ancient religion in Greece, Italy, The Levant and the Near East. Recent scholarship has illustrated how textiles played a large and very important role in the ancient Mediterranean sanctuaries. In Greece, the so-called temple inventories testify to the use of textiles as votive offerings, in particular to female divinities. Furthermore, in several cults, textiles were used to dress the images of different deities. Textiles played an important role in the dress of priests and priestesses, who often wore specific garments designated by particular colours. Clothing regulations in order to enter or participate in certain rituals from several Greek sanctuaries also testify to the importance of dress of ordinary visitors. Textiles were used for the furnishings of the temples, for example in the form of curtains, draperies, wall-hangings, sun-shields, and carpets. This illustrates how the sanctuaries were potential major consumers of textiles; nevertheless, this particular topic has so far not received much attention in modern scholarship. Furthermore, our knowledge of where the textiles consumed in the sanctuaries came from, where they were produced, and by who is extremely limited. 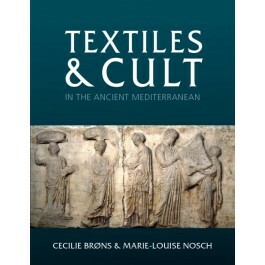 Textiles and Cult in the Ancient Mediterranean examines the topics of textile production in sanctuaries, the use of textiles as votive offerings and ritual dress using epigraphy, literary sources, iconography and the archaeological material itself. "The present volume is an interesting and useful contribution to the study of ancient textiles that enriches our knowledge of their use and value through their examination as visual, tactile and material items."